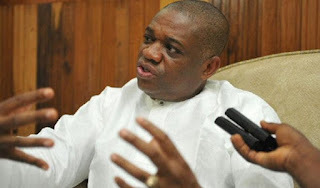 Former Governor of Abia State and Chieftain of All Progressives Congress (APC), Dr. Orji Uzo Kalu has faulted report in an online medium alleging plot by the his mother, Elder (Mrs.) Eunice Uzor Kalu, to destabilize the Peoples Democratic Party (PDP), Bende North, Abia State. The former governor in a statement by his media office said the report was false, adding that the "perpetrators and cohorts of the evil act are afraid of losing their seats in the 2019 general elections." The statement said the fake news was another ploy by political jobbers and their sponsors to tarnish the hard earned achievements of the septuagenarian. Kalu also reiterated that his mother remains a chieftain of the APC and she's not involved in any plot to destabilize the PDP. The statement read: "The propaganda being circulated by PUO reports is not only misleading but another wicked attempt to blackmail the mother of our principal, who is also a chieftain of the All Progressives Congress (APC). "This is not the first time negative and wicked lies are fabricated against our principal’s family members by the same set of people. "We will not lose sleep over the antics and activities of these discontented individuals, who have no tangible and sustainable means of survival other than cheap political blackmail and character defamation. "In a democratic set-up, we should engage in constructive criticisms as against peddling lies and rumours.